Huaoranis create some superb handcrafts. They use achiote, a round, spiny fruit whose crushed seeds ooze a bright red juice, to paint natural fibers and their body for different occasions. Both men and women fabricate gorgeous collars using seeds, wild boar teeth, and parrot feathers. The Kome is the name for the traditional Huaorani clothing which consists of a string wrapped around the waist that men use to tie their foreskins. 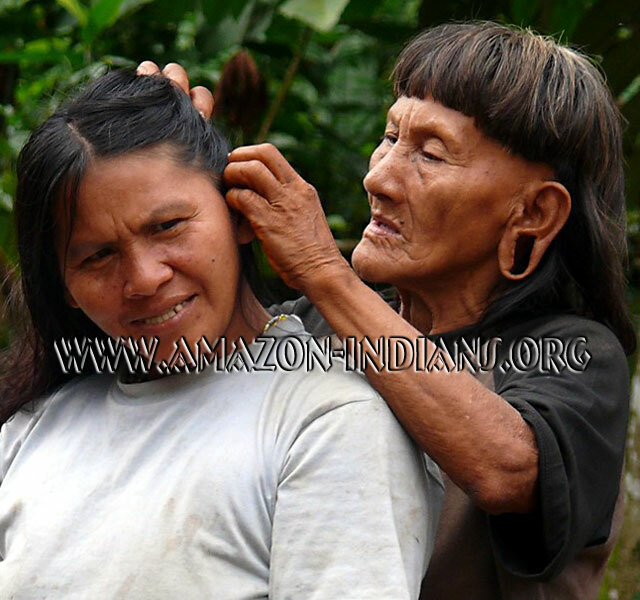 The typical Huaorani hairstyle is long hair in the back, with short bangs that go behind the ears. Elders have pierced ears, with the earlobes hanging down like looped rings. These large pierced earlobes are a Huaorani trademark. Younger generations have stopped piercing, as it is a very painful process; even brave warriors complained about the pain they had to go through in their childhood having their ears pierced in this manner. A typical Huaorani house is very tall, measuring ten meters in length by five meters in width. Men build the houses by first creating a semi elliptic frame out of flexible poles deeply rooted in the ground. Parallel with the floor, they tie more poles on which later on they place two layers of leaves in such a way that rain does not get in. These big shelters are dark, refreshing, and comfortable. Usually more than one family lives in a house, and typically, a couple lives with their children and the parents of the husband. Nowadays, more Huaoranis build their houses smaller, and only one couple with their children lives in the house. Along the walls there are hammocks woven by the female occupants of the house. These are the beds where everybody sleeps. There are usually two or three fireplaces on the ground as well. Strings are tied in between the sustaining poles, to hang hunting tools, baskets, clothes, and other items. The Huaorani believe that when someone dies, the soul starts a journey towards heaven. On the way, in the middle of the path, a big anaconda is obstructing the way. Only brave souls can jump the boa and reach heaven. Whoever fails, returns to earth as a termite, and leads a miserable existence.